When they search, make sure they find you! WP Hatch manages your brand’s online profile information so prospects can actually find you when using online search engines like Google and Bing. As part of your local search plan, we constantly update your information with updated tactics to achieve the highest possible rank in search results. If you’re not on page one of a local search, they’ll never find you. How much does that cost in lost sales? 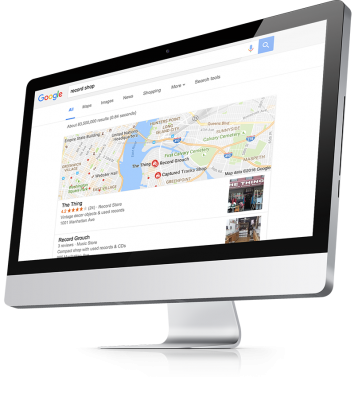 More and more, your business success depends on finding new customers, and new customers finding you in local search and maps. Online searches on Google and Google Maps are the #1 way consumers find veterinarians. An optimized local search plan is far more important than advertising on outdated platforms like the Yellow Pages. Need proof? 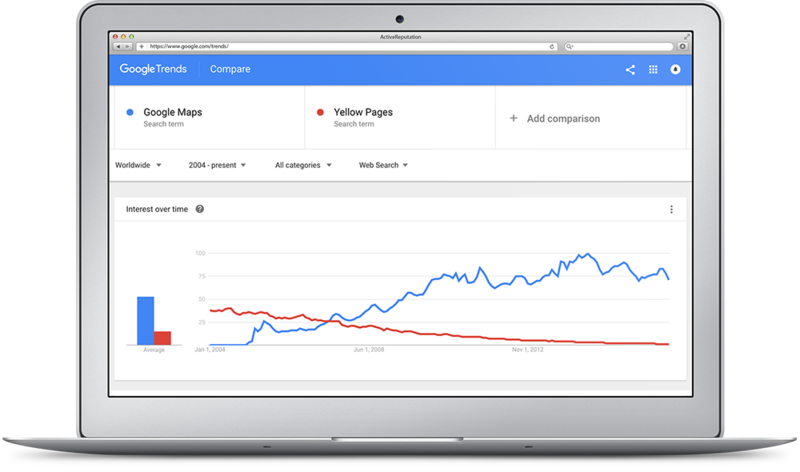 Check out the data comparing the popularity of Google Maps to Yellow Pages. Veterinarian lead generation isn’t easy. 81% of consumers research online before they buy. Being on the first page of their search results gives you the best chance of winning that business. Whatever you do, someone is searching for it online today. Users perform 40,000 searches per second on Google alone! And 84% of Google users skip the paid advertisements and go straight to the organic search results. How do you get more customers? Improve your rank in organic search to show up before your competition. When your search rankings increase, your web traffic skyrockets. More traffic brings more leads for veterinarians, and more leads turn into sales. Local SEO is a strategy that pays off month after month to grow your veterinary practice. That’s a great ROI. Our strategies are specifically designed for you, the small business owner. We care about the same things you do: Results, Service, and Price. We deliver results with full service at a price you can afford. Search engine optimization targets customers looking for services you offer by optimizing the content of your website and using offsite tactics. Attract more customers – and away from competitors – by increasing website traffic and ranking for targeted keywords on major search engines. Our expert SEO services team will build a customized program that focuses on your most profitable customers, monitor your results, and adjust as your business changes. Our Local SEO for Veterinarians plans start at just $499 per month. How did you hear about WP Hatch?